On a cold but sunny morning in March I found myself wandering around an unfamiliar part of Birmingham trying to locate the Birmingham Midland Institute for my first Friends of the Earth West Midlands Gathering. As I always expect to take a wrong turning when going somewhere new, I unexpectedly found myself at the venue half an hour early, having made no mistakes at all…highly unusual! It was great to see so many members of regional groups. I spoke to members of FOE including groups from Dudley, Hereford, Walsall, Wolverhampton and affiliated groups. It was nice to see that our Birmingham group weren’t outnumbering the others. After tea and an overview of the last years highlights from Jenny, Community Activism Team Leader, and Chris, Midlands Regional Campaigner, some of the groups explained to us what they’d been campaigning on which can quite often be different to what we focus on. The Wolverhampton group told us about their inspiring campaign for zero waste, and Burton Conservation Volunteers told us about their work ‘out in the field’ coppicing, dead hedge laying and the like. 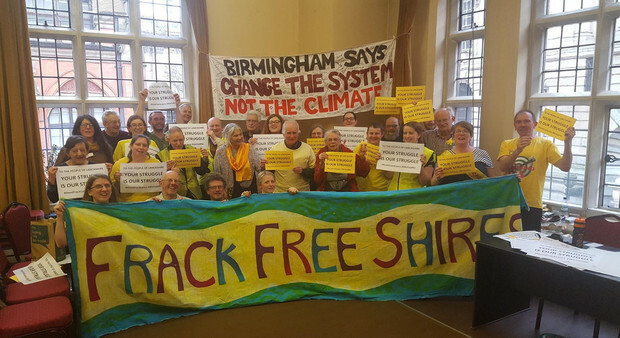 The Hereford Group told us about their walk to London to highlight the anti-fracking movement and Libby, our Campaign Support Worker successfully laid out what our new climate refugee campaign is all about, despite having stage fright! After a shared lunch, the afternoon was focused on two sets of 3 workshops. I chose ‘How To Campaign For Clean Air’ and ‘How To Reach New Audiences Through Clean Air Campaigning’, because I wanted to concentrate on our new Clean Air campaign. Aaron and Claire did a great job hosting these workshops, explaining the problems and the solutions we should work towards. Chris kept us all in order when were in danger of drifting off at a tangent. We also did a solidarity photo to show support for those in Lancashire who are on the frontline fighting against the fracking drills of Cuadrilla, who have the cheek to call us “The unacceptable face of the charity sector” for daring to challenge their wanton destruction of our green and pleasant land. After a lengthy, fun and inspirational day, most of us retired to Edmunds Brew Pub round the corner, for more chat and some fine ales. Marvellous!